Sunny days, short shorts and street food, a good day in my opinion. The short shorts were on other people of course as elevator repairmen have to wear pants. 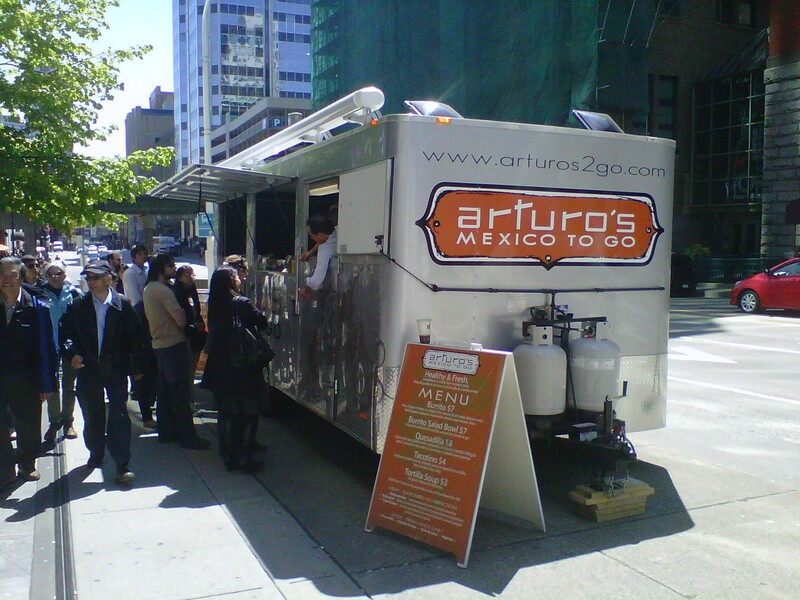 A couple of days at Pricewaterhouse Coopers Place (250 Howe street) meant I was within smelling distance of Arturo’s Mexico To Go, another of Vancouver’s street food vendors. 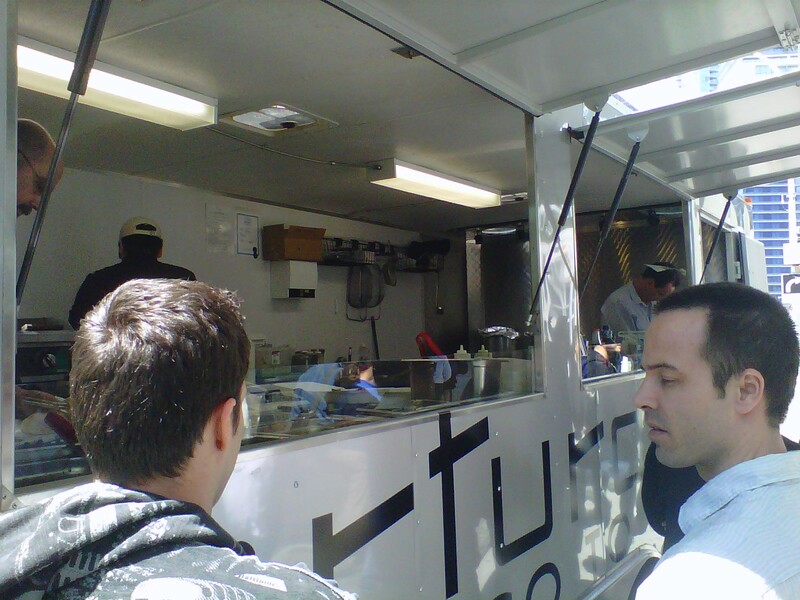 Taco trucks are a regular sight on the streets of LA and have a reputation for being very hit and miss. I had my fingers crossed that Arturo’s would be as good as the rest the street food I’ve had since I started writing this blog. Arturo’s is run out of a trailer which is spacious compared to any other street food setup I’ve seen, wide and easy to get around. It makes me think that this trailer would be better suited for something more labor intensive and complicated than tacos and burrito’s. I had a Sirloin Beef Burrito ($7) and the Tacotino ($4). Being a sunny day the lineup was long but moved along quickly. I’m not one to normally carry cash so I appreciate street food vendors who offer debit/credit but it really slows down the payment process and I make a point of always paying in cash so I don’t hold up the line. The food, the Tacotino, rotisserie pork with chipotle and lime sauce in a tortilla was not what I was expecting. The meat had a strange texture that was a mixture of crunchy/chewy/dry which was overpowered by onion and chipotle flavors. The taste stayed in my mouth for hours after lunch even after some water and a tictac. The Burrito was much better, the beef was tasty and the other fillings were nicely seasoned. I especially liked the use of corn which added a nice summery sweetness to the dish. One winner, one loser. I’ve been told the Gringas are quite good, I’ll have to try them next time I’m in the neighborhood. Everyone knows how much I like street food and a sunny Friday means that eating some is an inevitability. 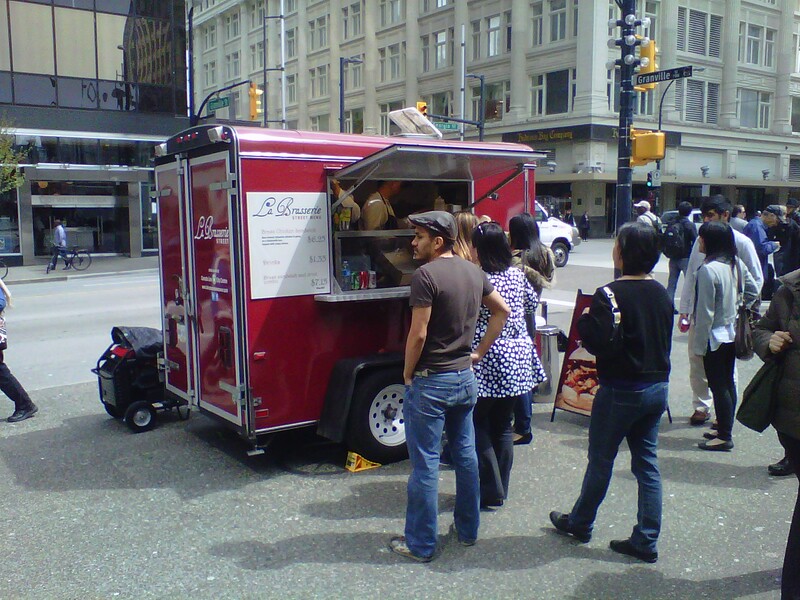 La Brasserie has recently launched a mobile food trailer and has nabbed a prime spot at the corner of West Georgia and Granville near the City Centre Canada Line station. I’ve heard great things from my fellow blue collar workers who have tried the Brass Chicken Sandwich and I couldn’t wait to sink my teeth into one! Being the first sunny day in some time the wait was a little on the long side but that’s a good thing for street food vendors. 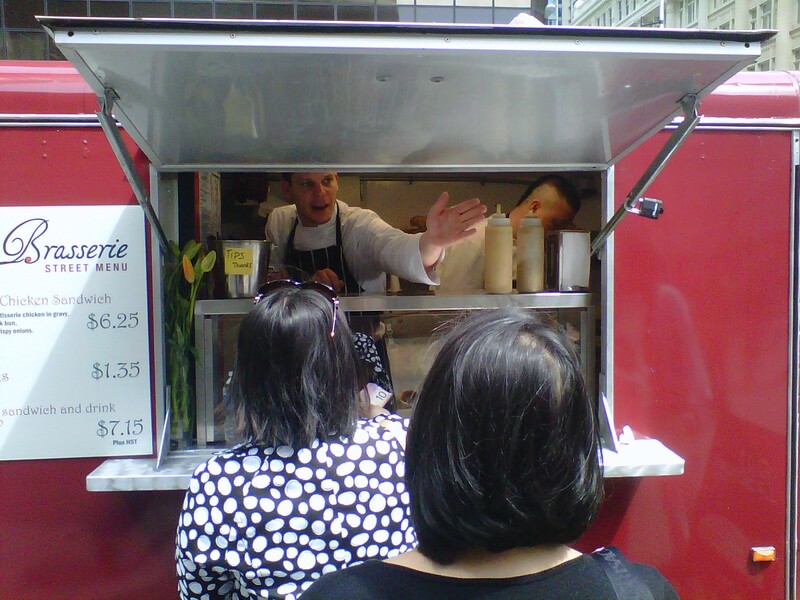 La Brasserie Street’s Twitter account claimed 45 person line ups that day, awesome! I ordered my sandwich and payed my $7 and patiently waited as the smell of delicious chicken filled the streets. There’s an added bonus at this location, while you wait for your food you can watch a very spunky little 3 legged dog chase a small rock that his owner throws for him. Seems like a good scam as tons of people were giving him money… Anyways, back to the food. After receiving my sandwich I loaded it up with hot Dijon mustard and took a big bite. My face appeared from the sandwich looking like a tennis ball that had been left out in the rain, covered in gravy and mustard. I’m sure there were many hot ladies walking back to their offices who thought “who’s that hot bearded elevator guy with the messy face?” It’s ok to look ladies but I’m taken. 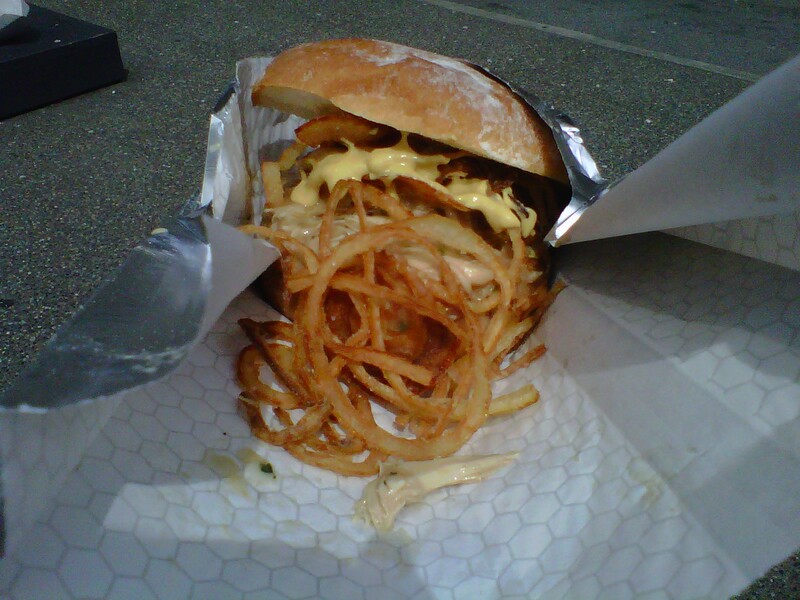 The sandwich was really good, beer braised rotisserie chicken, rich and well seasoned chicken gravy and crispy onions on a fresh buttermilk bun. Very simple food is amazing when done right. This ain’t no Sous Vide truffle infused gastro wonderchild, it’s a really good chicken sandwich at a good price. 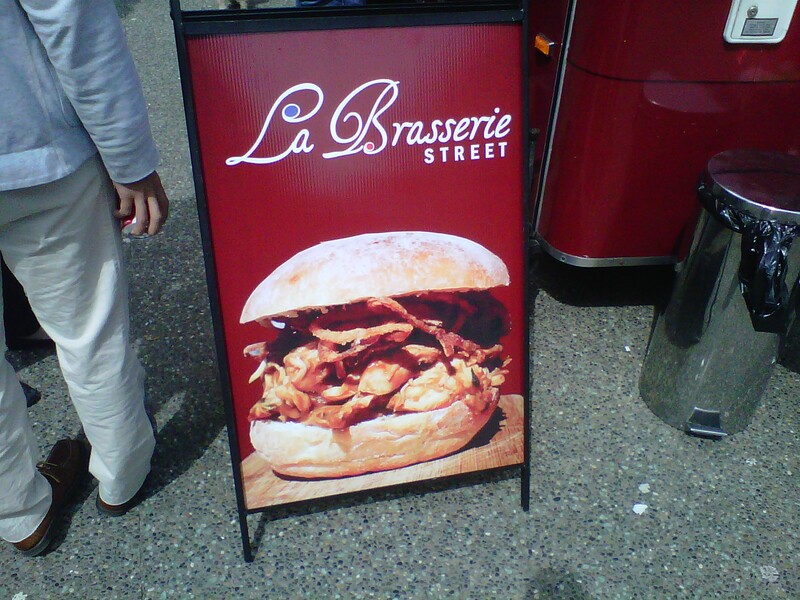 That’s what street food is all about and La Brasserie Street totally gets it. 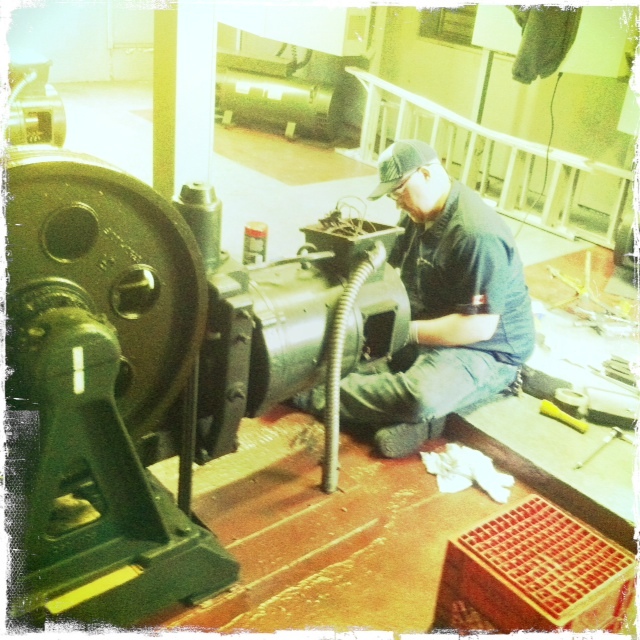 As some of you may or may not know when I’m not out on the town eating, drinking and taking pictures I fix elevators for a living. I am also a dad to a super awesome 1 year old girl named Hayley and since she’s in a stroller I find that I am taking elevators a lot more then ever. I didn’t really use elevators much before Hayley unless I was in a high rise or the stairs weren’t accessible but now it’s a necessity. I have noticed that a lot of perfectly healthy able bodied people take elevators up or down 1 or 2 stories and it has really started to bother me. Elevators are for people who can’t take the stairs, parents with small children, the elderly, people with physical disabilities etc. not for lazy assholes. The part of my job that makes it all worth while is making buildings accessible to everyone but somewhere along the way people have decided that taking the stairs is far too much work. Escalators are often within sight of mall elevators but there is almost never enough room for my daughters stroller in the elevator let alone a wheelchair. Minus 10 points for modern convenience. Thanks for reading my little rant, now back to regularly scheduled programing.